Northern Wisconsin is ready for you. Are you ready for an outdoors adventure? North Wisconsin Snowmobile Trails: Groomed or Ungroomed? If you are new to using snow recreation rentals or to the snowmobile trails in Wisconsin, it is important to keep it simple. However, even the most seasoned snowmobile rider might need a refresher if it has been awhile since they have gone riding. When you rent a snowmobile in Wisconsin from Adventure North Rentals, we will go over the basic guidelines with you for using snowmobile rentals in Bayfield County and the surrounding area. This is important because even if you have experience riding snowmobiles in another state, things might be different here. It is important to know the legal requirements for the state when you rent a snowmobile in Wisconsin to ensure that you don’t accidentally break any laws. In addition to learning the local laws, you should always make sure to start every ride with a basic check-list for safety. Before you head out to explore all of the amazing snowmobile trails in Wisconsin, it is important to perform a basic safety check of your snow recreation rentals. The first thing to check is the trail conditions and weather report. This will let you know how much snowfall is expected and whether or not the conditions are safe for a person of your level of experience. Even the most experienced riders will take care when the conditions are rough. If it is safe enough for you to go riding on your snowmobile rentals in Bayfield, go through the following questions to make sure you are fully prepared. How much snow is expected to fall in the next 24 hours? How much snow is already on the ground right now? 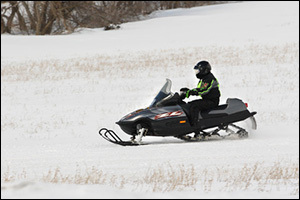 Will there be enough snow for you to safely navigate the snowmobile trails in Wisconsin without running into trouble? What type of clothing and/or gear should you wear to stay warm and safe in the predicted weather conditions? Have you made sure that the snow recreation rentals are fully gassed up and topped off with oil? Do you know how long the snowmobile will run before you need to get fuel again? Do you know where you can stop and get fuel while out on the trails? Make sure to choose the trails that you will ride based on your experience. There is no shame in starting out with smaller and easier trails when you rent a snowmobile in Wisconsin for the first time. Even after a couple of visits, you might want to avoid the really extreme snowmobile trails in Wisconsin until you are sure you can handle them. Go over the trail map with one of the staff members at Adventure North Rentals when you pick up your snowmobile rentals in Bayfield or have them delivered. Find out which trails they recommend for you to start with and ask for any advice that they can share. Consider visiting the North Wisconsin area during one of our many festivals and snowmobiling events. There are also other events hosted this time of year in many of the towns and villages, as well as special offerings at local restaurants, pubs and inns. Check them out online and plan your trip via the snowmobile trails in Wisconsin around the events. Contact local snowmobiling clubs to find out more about group rides, races and other structured events that you can participate in based on your skill level and experience. Visitors to North Wisconsin who are interested in learning more about ATV or snowmobile rentals in Bayfield should contact Adventure North Rentals. We have a wide variety of Arctic Cat and Skidoo snowmobiles available for rent and some exciting Polaris ATV rentals as well. We can help you get set up with a reservation over the phone or you can sign up to rent a snowmobile in Wisconsin through our website. You can pick up the snow recreation rentals at our Bayfield, WI shop or we can deliver it directly to the trail head or wherever you are staying in the area. If you have any questions about any of our rentals that can be used to explore the snowmobile trails in Wisconsin, our team is here to help. We provide top quality machines to ensure that your visit to our area is a memorable experience. With over six hundred cleared trails and over a thousand ungroomed forest roads to check out, there’s a lot to see, do and experience in the Bayfield County area. 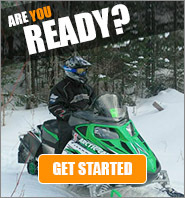 Give us a call at 715-779-3150 to reserve your snowmobile or ATV rental today!